I had the pleasure of attending a lunch at the Condé Nast Building today for an exclusive preview of the new Architectural Digest. Margaret Russell walked a small group of us through the new features that debut in the March 2011 issue. I can tell you without a doubt that you are going to love it! The magazine hasn't changed so much that long time subscribers will be unhappy but it has been freshened up enough to now appeal to a broader audience. I was especially excited to see the Fifth Avenue apartment of eccentric fashion iconDaphne Guinness by Daniel Romualdez and the Paris home of Pierre Passebon, antiquaire and partner of Jacques Grange. There is also a gorgeous Mississippi home designed by Richard Keith Langham and the cover shot of room designed by Michael Smith could not look more chic. 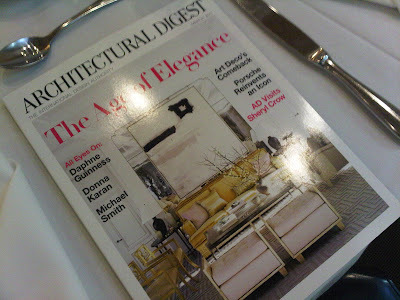 I hope the March issue of Architectural Digest finds its way to your mailbox or local newsstand soon!